I went to the Somerville Library Book Sale after work today and picked up a few things. 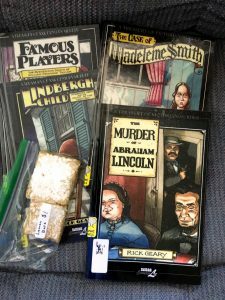 It was a pretty good deal: four Rick Geary books and two lemon bars for $3! I’m a big fan of Rick Geary. I used to make a point of visiting his table at SDCC every year, back when I was going to SDCC every year. (Those were the days…) He’s a good guy, and his “true crime” books are really good. I also got a chance to see a few of the books I donated last week one last time. I hope someone picks them up and enjoys them. And I saw a few things that made me realize that I could have donated even more stuff: they had a good number of old CDs and DVDs (and even cassettes and VHS tapes), so I really could have gotten rid of some old CDs and DVDs at least. I do feel a little bad that I didn’t pick up any regular (non-graphic) novels, but they didn’t have anything I really needed or wanted.